1) The illegal must have longevity. Newt mentioned an example of 25 years in the United States. 2) He must have family roots here. 3) He must already have a job. 4) He must not have a criminal record. 5) He will not be offered citizenship. From what I can see, he's not offering much. In 2001, the Bush administration was comfortable with the figure of 3 million illegal aliens, far less than the 12 million here now. So, what's he offering? Maybe 500,000 green cards? As for taking citizenship off the table, that means nothing to the illegal aliens. 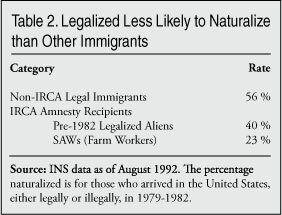 Here's a chart showing the percentage of the 1986 amnesty group who later became citizens. This illustrates the falsehood of declaring that illegal aliens want the American Dream. They don't. They want to work here and take advantage of our standard of living, but they really don't buy into our Constitutional Laws and our free market economy. They are perfectly willing to live three of four families to a home and send $300 a month back home. Our main source of all immigrants is Mexico, and their naturalization rates are pathetically low. Only about 25% of eligible Mexicans bother to naturalize, despite campaigns like fee discounts, free classes and even programs to get them on the voter rolls, such as the Al Gore "Citizenship USA" program in 1995. It appears that Gingrich is offering a plum to attract brown voters without really doing much. Such a move is smart, but oh so dumb. Any form of amnesty is just plain wrong for America and sends the wrong message. To reward bad behavior is never a good idea. And any amnesty really fails to address the litany of local problems caused by black market immigration. If we don't control entry, we lose everything afterwards. Who are they? Why are they coming? Will they become a public charge? Are they capable of self-insurance? Will they need subsidies for food and housing? Do we have the capacity to educate them?Are they healthy? Do they have criminal intentions? Are they terrorists? They have bypassed the very reasons we have immigration laws in the first place. And Newt is spitting in the face of our own unemployed as well as those who are waiting to come here legally. Perhaps most important is the push back required to hold the line against the 165 million people in the third world who have an eye on the United States as their new home. What do you do with the 12 million? You enforce the law and they will self-deport. Mandatory E-Verify and a review of the existing workforce will put pressure on those who have false documents and, more importantly, leave unscrupulous employers without excuse. Prosecute the business owners and you will see a vast improvement in compliance. Deporting people who are here illegally (rather than apologize for them) will send a message that it is no longer safe to live here without papers. They WILL go home once they know we are serious about enforcing our laws. Gingrich is dead wrong on this one.